Cubeo organiser tags - never forget that library bag again! 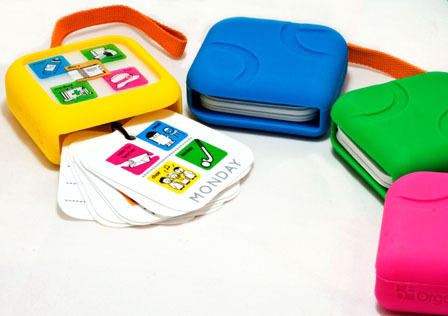 Cubeo organiser tags – never forget that library bag again! I’m sure I’m not the only parent who finds weekday mornings exhausting. I ask the same questions over and over (do you have your lunch/reader/swimming bag/special blue pencil?) to both my school-aged children and in the end figure I may as well pack their school bags myself to save some energy. The Cubeo is a fantastic invention by two Australian women to make things easier for both children and caregivers. As you can see in this short video, it gives a helpful visual cue to children about what they need on that given day, ideally making them responsible for packing their own bags (and no more “Mum, why didn’t you remind me?”). A completely reusable product, it comes with more than eighty stickers to cover every possible school and after school activity. Cubeo is a cinch to use and to understand. Available in four fun colours, it fastens securely to your child’s bag so there’s no fear of losing it! Get your Cubeo from Metro Mum, priced at $19.95, with delivery available Australia wide.